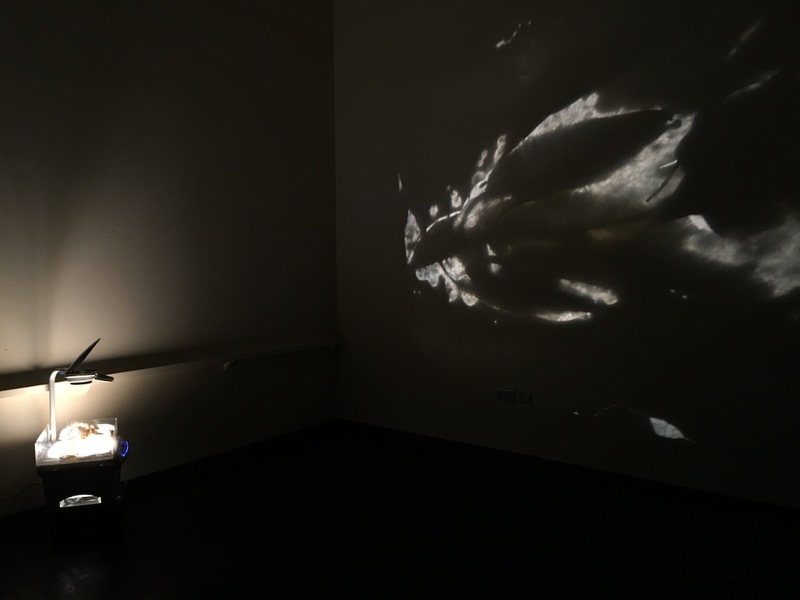 Aoife Fogarty, Engulf, installation view, image courtesy of the writer. 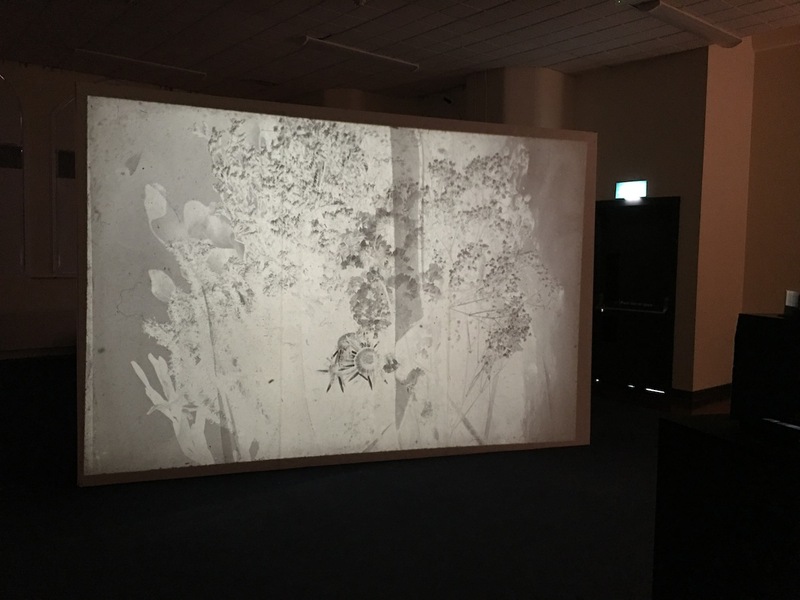 Aoife Fogarty’s Engulf at the DIT Graduate Exhibition was an installation of projected images of decaying flowers and expressionistic mould spores. On either side of a wall that diagonally bisected the exhibition space, two analogue slide projectors on plinths were stationed. 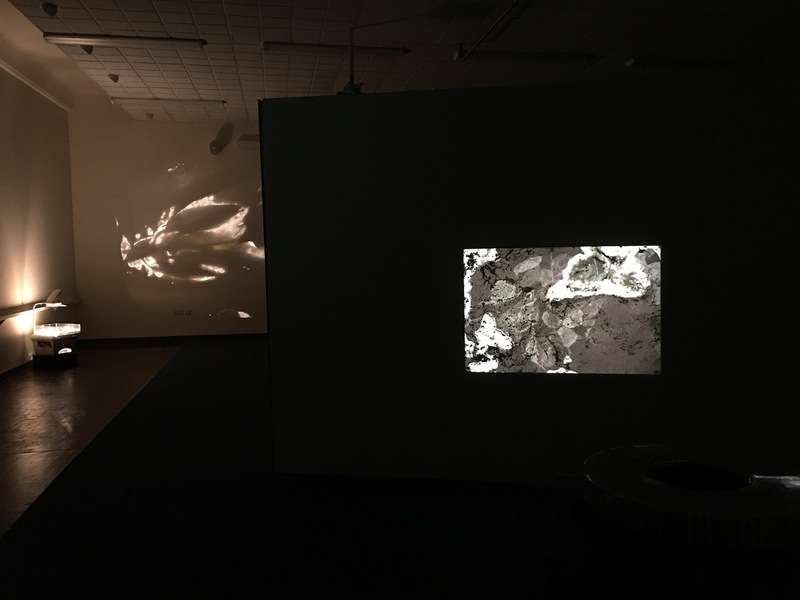 One side featured a large format projection, while on the far side, a second, smaller projection with discrete seating made for more intimate observation. The negative images of cut flowers conveyed different potential meanings of declarations of love or sympathy. These were interspersed with images of flowers cast aside in rubbish piles, and of creeping patterns of tactile micro-organisms growing on the slides, referencing a different kind of ‘bloom’. 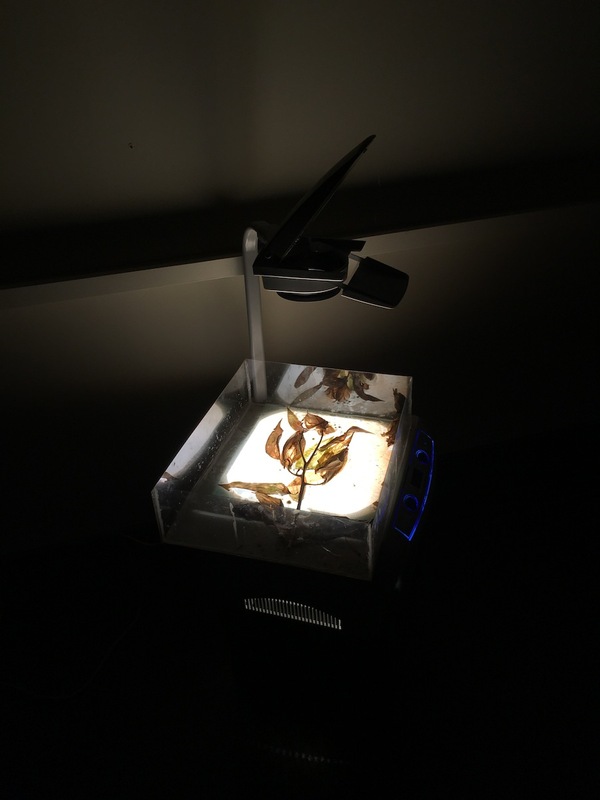 Stationed in a corner at floor level was an overhead projector that displayed a clear acetate box containing decomposing flowers. 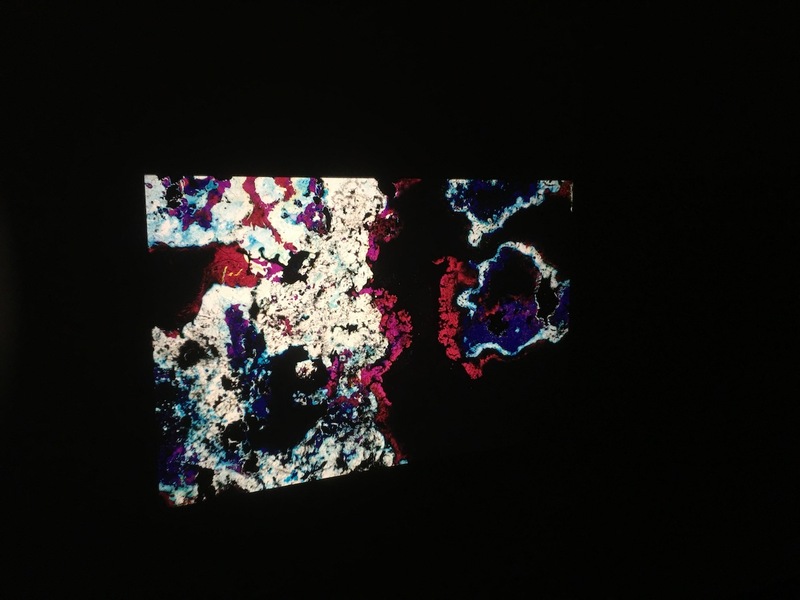 The negative space translated by the projector onto a perpendicular wall was intriguing in terms of the exchange of negative and positive that Fogarty appears concerned with in this body of work. Furthermore, within the context of the installation, it was apt that when one leaned closer to observe this sculptural element, the silvery glint of a tiny spider’s web was visible on the lens housing of the projector. The title Engulf, fittingly suggested the process utilised in the creation of this work, for the slides were buried in soil to initiate the growth of micro-organisms, altering the surfaces of the images. I was struck by the slightly stagnant atmosphere of the dark installation space, a combination of heat released by the projectors, lack of airflow, and the unusually warm weather outside. Though unclear if this was the artist’s intention, for this viewer it contributed a particular affect, leading one to speculate about the conditions necessary to enable spore growth, in addition to hastening the real-time decay of the decomposing flowers. While there is most certainly a nostalgia associated with the use of analogue photography in the digital age, Fogarty’s conceptual explorations with different processes of developing images via mould proposed that in the decay of a medium there remains a fascinating potential for transformation.